Celebrate your moment. Life is full of highs and lows. The Message Bible has the words to carry you through each one. Words of comfort and celebration. Words of heartache and hope. Enjoy the gifts that life brings and a Bible that can express each moment. The Message is a reading Bible translated from the original Greek and Hebrew Scriptures by scholar, pastor, author, and poet Eugene Peterson. 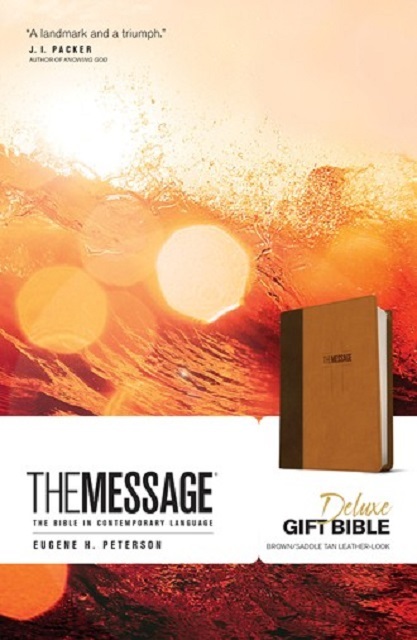 Thoroughly reviewed and approved by 20 biblical scholars, The Message combines the authority of God’s Word with the cadence and energy of conversational English. For the first time as a gift bible, The Message includes all these popular features! Personalize your Bible with the colorful presentation page. Find passages with The Message’s unique verse-numbered paragraphs. See the big picture with “The Story of the Bible in Five Acts.” Get your bearings with handcrafted maps, charts, and timelines. Use your Bible for years to come with its durable binding. Keep your place with a satin ribbon marker. Read The Message and fill your life with the unexpected passion and personality that fill God’s Word. Kiadás ideje: 2016. október 1.